Upgraded airstrip? Or downgraded island? They’re at it again. They want a LITTLE upgrade: 1) abandon a perfectly good airstrip, which seems to bring more tourists and more tourist spending to Little Cayman than Cayman Brac manages to draw with its BIG airstrip; 2) move it to a new site for the odd reason that the existing site doesn’t belong to the government. A little upgrade is like being a little pregnant. Response #1: Why not buy it if you insist on owning it? Won’t they sell? 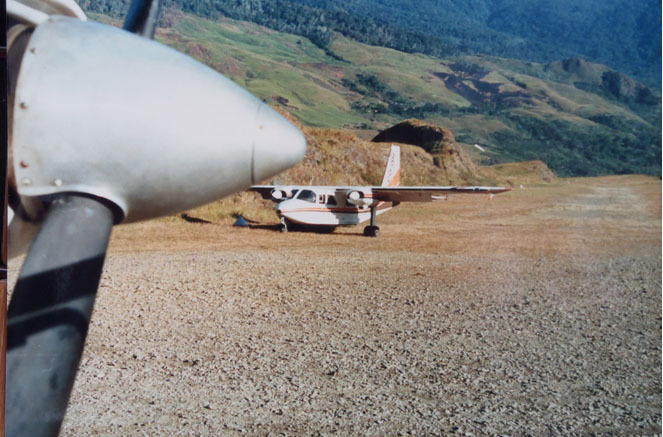 It has been THE AIRSTRIP for a very long time. Is there no expropriation law here? Response #2: You don’t need to buy it, just regulate it. I’m sure you do already, since I don’t see any gardening on the strip. In several countries with top-notch air safety reputations, governments have sold their airports to private capital. Governments CAN ensure the highest standards, even if they don’t own the land and facilities. That’s how it’s done here with sale of alcohol, regulation of the airwaves and telecommunications, even, one assumes, regulation of the equipment carried in boats. The mother country is even selling the post office, but will continue to regulate it. Tens of thousands of airports around the world are private. You can govern without owning. In the country illustrated in the accompanying photo, pilots themselves inspect the 350 airstrips. If they don’t like them they don’t land. They simply shut them down. The people repair them very quickly! Perhaps we should be proud of our small, private but well regulated air service on LC. Response: You cleared it a few years ago. Instance: A new strip would allow the operator “to use more cost-effective turbo-prop aircraft …”. Response #1: Cars do not drive across the LC runway. They drive parallel to it, but are halted to let the craft pull into the terminal. Moving the terminal and the fire station to the infield would obviate this need. The fire trucks wouldn’t have to cross the public road to reach the scene of an accident should one occur. The public would reach the terminal from the area of the existing large storage building. Response #2: In Gibraltar, a much larger island, the main connector road is closed for each takeoff and landing. In Singapore Chiangi (5000 take offs and landings a week) the main vehicular road can be commandeered by the air force to deploy its fighters in case of war. The double use is occasioned because the city-state is located on a small island. Response: Then don’t let it develop. See above. You can regulate, even when you don’t own. Sounds as if this airstrip may not have been regularized. What have successive governments been doing, these many years? Better get on it. Priorities:	Without telling the government what to do, it would seem that the airport that needs upgrading is called Owen Roberts. It was pretty sad to see travelers in the departure lounge being escorted by security to temporary outdoor toilets for many days. Fixing Owen Roberts benefits all of us. It is an urgent, overdue, top national need. EIA: At the very least, if some powers-that-be insist on a new strip for LC (there may be reasons not yet revealed to us) let’s insist on an environmental impact assessment beforehand. It can be performed without recourse to bulldozers and fires, and without permanent damage to delicate natural systems, and at modest cost even with a broad mandate. Bottom Line: Do not destroy more forest on Little Cayman! Our country has only one tiny, perfect island. It is attractive to the connoisseur traveler, who is very well catered for indeed. It is not suitable for mass tourism.